Entertainment One, 93 minutes, PG. Director Jon Baird takes liberties with the actual events upon which Stan and Ollie is based, but he got it right to present the relationship between them as a love story. It was not one in which a couple gazes at each other with puppy dog eyes as (metaphorical) fireworks explode against a background of string-heavy romantic music. Theirs was a non-sexual love that was deeper than friendship. It was every bit a can’t-imagine-life-without-you tale. Stan and Ollie gets my vote for the biggest surprise of early 2019. I expected Steve Coogan (Stan Laurel) and John C. Reilly (Oliver Hardy) to be good and they surpassed my expectations. What I didn’t expect is how much I would care about their alter egos. Like most people my age, I used to watch recycled Laurel and Hardy films on TV when I was young. Those “old” movies–as I saw them then–were my initial contacts with cinematic history, but I thought no more about the individuals behind the roles than I did of the real-life Abbott and Costello or Three Stooges. 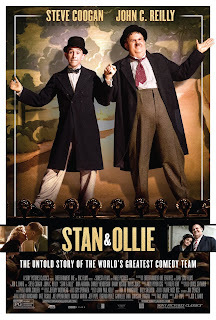 In my view, Stan and Ollie is one of the better celebrity biographies in quite some time. For you non-Baby Boomers, Laurel and Hardy were among the few comedy acts that survived the transition from silent films to sound. (Charley Chaplin and the Marx Brothers also made the shift.) The tall, rotund (6’1” 280 pounds) American-born Oliver Hardy (1890-1957) played straight man to the bumbling lean English-born Stan Laurel. Each had made scores of silent films before they teamed permanently in 1926. Over the next 25 years, though, they made an astonishing 107 films together, 23 of them full-length features. They became so well known that some of their stock phrases such as “Doh!” and “Well, here's another nice mess you’ve gotten me into” were pop culture buzz phrases, and Laurel’s unique head scratch was much imitated. Theirs was a vaudevillian mix of song, dance, and slapstick comedy. Stan and Ollie opens in 1937, when Laurel and Hardy are (allegedly) the top-drawing act in Hollywood. (Actually it was Gary Cooper.) In the film, this is the pinnacle of their careers and they split when Hardy didn’t walk away from his contract with producer Hal Roach. It is true that Hardy was still under contract for six months after Laurel’s contract expired–a deliberate ploy by Roach to prevent team bargaining–but the two were estranged for months, not 16 years as the film implies, and Stan wasn’t angry when Ollie took roles in two (awful) films without him: The Fighting Kentuckian (1949) and Riding High (1950). Laurel actually encouraged him to go forth because they were angry with post-Roach studios that didn't give them script control. In the film we leapfrog from 1937 to 1953, when the fading-from-public-acclaim duo reunited for a stage tour of the United Kingdom and Ireland. (Actually, they made a film, Atoll K, in 1951, but there was a hiatus occasioned by Hardy’s health problems.) At first they played to nearly empty houses, but the two soldiered on to rebuild their fame and friendship. Their final performance was a triumphant show in Plymouth, England, on May 17, 1954, by which time Hardy was battling congestive heart failure. Forget the script's deceptive turns. Coogan and Reilly are as sublime as the originals. They are nimble with quips and light on their feet, a particularly deft feat from Reilly, who wore a fat suit and prosthetics that added a hundred pounds to his fighting weight. The two interact in ways that are about as close as two heterosexual males can get without crossing the identity line. This extends to moments in which they are with their wives, Lucy (Shirley Henderson), Hardy’s second (and last) spouse; and Ida (Nina Arianda), Laurel’s third (of four). We witness a pair that is only really in their element when they are together, even if they are angry with one other. Coogan is terrific as a man at sea when faced with being on his own, and Reilly is so good as Hardy at the end of his string that it’s easy to overlook the subtlety embedded in his quiet performance. Both deserved Oscar nominations, but Hollywood doesn't like to honor films it doesn't make*. If one wishes to nitpick, begin with Shirley Henderson. I don't understand why she gets roles given that her dictation and voice are unintelligible. She’s also outdone by the feisty and snarky Arianda. Neither woman had a lot to do in this film but for once this isn’t sexism; the true love story is that of Stan and Ollie, who spent more time with each other than with any of the women or children in their lives. Another small critique is that a few of the exterior shots are rather obvious cheap sets. Maybe Stan and Ollie isn't cutting-edge filmmaking, but director Jon Baird does a nice job of evoking the 1930s and early 1950s. For a short movie, Baird and screenwriter Jeff Pope also do credit to what film buffs will recognize as Sunset Boulevard syndrome. Must faded stars disappear into a black hole? Maybe not. *Entertainment One is a Canadian company and England's BBC Films coproduced it.